LG G5 – Can you manage without an app drawer ? This is my LG G5. 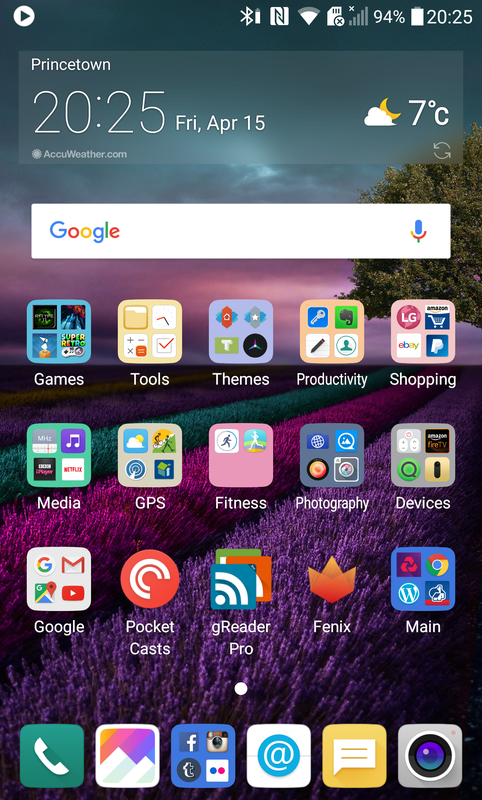 There is only one home screen and no app drawer. I have 130 apps installed. There will be lots of content coming soon on the LG G5. Any questions please ask away. Part of the attraction of Android is the customisation and the ability to keep the homescreen clean and uncluttered while having swipes and gestures to take you to apps and tasks you use. I have 9 icons for my main apps on my homescreen and the rest of the main ones in folders hidden in a dock page one swipe to the right. I know we still need a custom launcher to do those things but can’t help feeling this is just a move to look similar to iOS for Android in general (probably for its simplicity?) – can’t see that as being a step in the right direction. Apps/folders on a different page is still following the iOS route though – just more pages of clutter :p Personally I’m glad options have been brought back to allow the app drawer to exist for now. Is there any sort of one-handed mode? I really like the way it’s done on iOS, even if nearly everyone I know with an iPhone thought it was a bug at first!